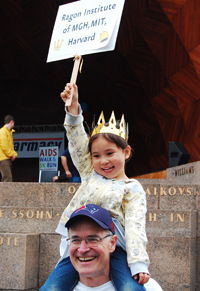 For 15 years, the Ragon Institute has shown their support for those fighting HIV/AIDS locally by raising funds and participating in the annual AIDS Walk Boston. AIDS Walk Boston is the primary fundraising event for AIDS Action Committee (AAC), the leading provider of HIV prevention and care services in Massachusetts. 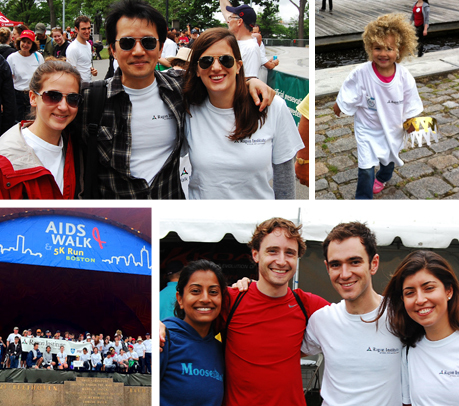 Prior to the walk, 93 individuals from Ragon and InterSystems raised funds from their family, friends and colleagues. By the end of May, Ragon had surpassed their fundraising goal of 20K and increased their goal to 30K. By June, Ragon had surpassed that goal again, bringing the total funds raised to $32,246! This is $11,000 more than last year, making Ragon the second highest fundraising team for the second year in a row! Congratulations to Bruce Walker who at $15,430 raised, was the second highest fundraiser for the entire event. 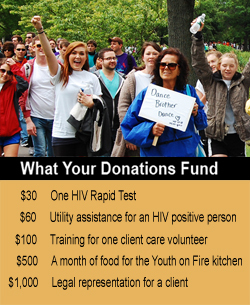 The money raised supports AIDS Action in providing HIV counseling and testing, pharmacy access, needle exchange services, mental health counseling, housing assistance, informational websites and hotlines, and legal services to those infected with HIV/AIDS in Massachusetts. Additionally, AIDS Action lobbies for fair and effective policies at the city, state, and federal levels. On June 3, a over 50 members of Team Ragon gathered at the Ragon tent on the Charles River Esplanade in Boston. After a team photo, they began their walk throughout the city. Some Ragonites participated in the Larry Kessler Run. Congratulations to Matt Hillyard, who won first place overall out of 659 runners in the Run! Team Ragon would like to thank Kristina Linden for doing a stellar job organizing the event and sending regular reminders and updates. Also, a thank you to Liz Regan for staffing the Ragon tent and Ragon Technician Jerome Rogich for volunteering as photographer. And a big thank you to InterSystems who raised over $3,000 and joined Ragon in the walk. And finally, a special thanks to the 324 individual donors who contributed to the success of the event. Ragon, the staff at AIDS Action, and most especially those fighting HIV/AIDS who benefit from the services of AIDS Action thank you!